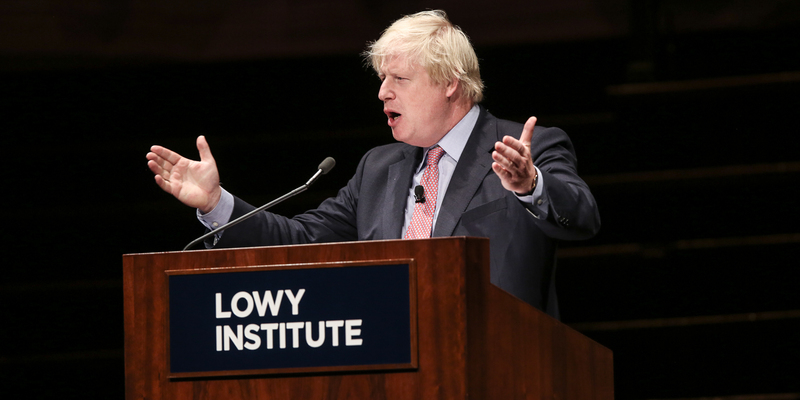 On 27 July the UK Secretary of State for Foreign and Commonwealth Affairs, the Rt Hon Boris Johnson MP, delivered the 2017 Lowy Lecture at Sydney Town Hall. It is great to be here in this wonderful Town Hall, alongside my friend and colleague Julie Bishop, and with Steven Lowy and Michael Fullilove. When I first came back to Britain after a year in Australia – at the age of 19 – it would be fair to say that I bore a pretty heavy imprint from my time in this country. My conversation was studded with words like “bonzer, mate” or “you little ripper”, and on the streets of London in broad daylight I insisted on wearing the same “stubbies” daks – shorts of appalling brevity – that I had worn in the bush until my then-girlfriend said that it was her or the stubbies daks. I am not sure how the contest was resolved. After years in the UK educational system my infatuation with Australian dress, manners, vocabulary and general cast of mind was so intense that I had become a kind of unconscious Les Patterson – a self-appointed and unwanted cultural ambassador. Insofar as my friends were able to understand me, it helped that this was the time when Neighbours and Kylie Minogue were propelling Australian life onto our screens, and when young Australians were beginning to pop up across the planet in a phenomenon that was set to music in 1980 by the band Men At Work. You will recall that the peregrinations of the man from Down Under – how he met a man from Bombay with not much to say; how he met the man from Brussels six foot four and full of muscles, and he asked him do you speak a-my language and he just smiled and gave him a vegemite sandwich – the point being that he was himself Australian. And from that lyric you deduce that second characteristic of the Australians – not only a fierce sense of identity and independence, but also a truly global country, engaged with the world in a way that is positive and fearless and upbeat. So keep those two features in your head – strong sense of national political and cultural identity, combined with a truly global outlook – as I ask you to conduct a thought experiment. I am told that Australia has just joined Eurovision. All I can say as a representative of a country that often seems to score nil points is good luck with that. But protract that logic. Imagine that in 1972 Geoffrey Rippon and Ted Heath had been able by some miracle to persuade our friends in Paris that distance was no obstacle. Suppose that by her abundant self-evident influences from Britain, Greece, Italy and elsewhere it had been decided that Australia was really European; a great, glorious syncretic European country and therefore eligible for accession – and suppose the French had said oui, and Australia had been admitted to the Common Market. What would have happened? Well, I think you could argue that there would have been advantages and disadvantages. Australia would certainly have continued to catapult huge quantities of butter and beef to Europe – more than ever, perhaps. But other things would not have been so easy. I mean no criticism of the model and methods chosen by our EU friends but you wouldn’t be running your own competition law or your public procurement programmes and you wouldn’t be able to tailor your green energy programmes to suit Australia’s needs. You would find yourselves regularly out-voted in the Council of Ministers on hours of work or the definition of chocolate. You would never have been able to come up with your own immigration policy – the fabled points-based system. And for the last 44 years you would have had to conform to the Common Agricultural Policy, and we must face the terrible probability that the EU’s ruthless quota and intervention policies – designed to protect existing Mediterranean producers – would have meant that Australia’s now legendary winemakers would never have got beyond the first tentative vintages because the whole lot would have been compulsorily boiled up and turned into bioethanol; and there would be nothing from the Hunter Valley on our tables tonight. And above an awful lot of your brightest diplomats would be spending their lives trying to stop things from happening, grappling in distant corridors with brilliant graduates of the Ecole Nationale d’Administration, instead of actually trying to get things done. And even if you think I am being paranoid, even if you think it might not have been as bad as all that, I think we can look at Australia today and after 26 years of continuous growth, and with per capita GDP 25% higher than in the UK, I think we can say that it was not absolutely necessary for Australia to join the Common Market. Indeed, it is safe to say that it was not necessary for Australia to join any bloc or grouping organised on the integrationist principles of the EU. Australia is not required to send well remunerated parliamentarians to an APEC parliament; and there isn’t a single APEC court of justice or currency, called the abalone, or whatever. Australia hasn’t been required in the last few decades to sign up to a series of treaties designed to create a single political unit out of a patchwork of 27 countries; and no one claims that such a process is essential for Australia’s economic health and well-being, nor that this prevents Australia being a successful member of international economic organisations or a committed multilateral player. So when we look at the forward momentum of Australia in the last few decades you can perhaps see why we in Britain are inclined to take with a pinch of salt some of the very slight gloom and negativity that is emanating from some distinguished quarters about the decision of the British people to leave the European Union. And you can see why we might be moved to reject their notion that little old Britain is just too small, too feeble, too isolated, to cope on its own. They say the UK is like some poor wriggling crustacean about to be deprived of its shell. I say – don’t come the raw prawn with me. On the contrary, when we look at what Australia has achieved, we can see grounds for boundless excitement and optimism. It is true that we may not have all Australia’s sunshine and other natural advantages; but we are the fifth biggest economy on earth, rated number two or perhaps number one for soft power, a permanent member of the UN Security Council, the second biggest contributor to NATO, we have the greatest financial capital anywhere in the world, with the biggest creative, culture and media sector anywhere in our hemisphere; and we are like Australians in that our population is possessed of the most extraordinary wanderlust – one in ten of Britons now alive is estimated to be living outside Britain, a higher proportion than any other rich country. Not just diplomats and aid workers either – though we certainly make a huge contribution to international activity. If you look at the five worst current humanitarian disasters – in Syria, South Sudan, Somalia, Yemen and Northeast Nigeria – you will find that the three biggest donors are the US, the UK, and the EU; and that is before you even take account of the sixth or so of the EU aid budget we also pay. We are hugely proud of that record - but of course we are not just talking of public officials. We are talking about six million bankers and journalists and artists and lawyers and athletes and – I kid you not – a policeman from Uxbridge who tours the world testing water slides: six million Brits spread out across the world in a great bright throbbing web like a scene from Avatar. And we have the chance now as we leave the arrangements of the European Union to become even more global, and when I say more global I do not mean for a minute that we will become less European. The Channel is not about to get wider. Britain is not going to sprout funnels and steam across to the Mid-Atlantic. We remain historically, culturally, intellectually, emotionally and architecturally European. Shakespeare is just as European as Michelangelo or Cervantes or Beethoven. Indeed, when you consider the range of his locations: Denmark, Austria, France, Greece, Italy, Cyprus, Croatia, Turkey, to say nothing of Lebanon, Syria and the New World – I think you could argue that he was more European in his interests than any other great artist. This European-ness is not just words: we show our commitment to Europe by our moral and military willingness to come to the defence of our friends, a commitment that we make unconditionally, irrespective of our EU negotiations. It is 100 years since British and Australian soldiers stood side by side in the Third Battle of Ypres, in what I still believe it is right to think of as a fight against tyranny. Today there are 800 British soldiers in Estonia, almost a quarter of the NATO mission in Eastern Europe, there to give reassurance in the face of any potential provocations from the east. We will continue to stick up for the rights of Ukrainians, threatened by Russian aggression and revanchism. We will work with our friends in the western Balkans, where there is currently a political and geo-strategic arm wrestle taking place; and we will continue to help them to achieve what they see as their Euro-Atlantic destiny. We will help our Italian partners as they face the challenge of migration from North Africa– cracking down on the vile people traffickers who put their victims to sea in leaky boats. We will continue to argue for balance and moderation in our European foreign policy; and yes, we join our friends in deploring the actions of the Turkish authorities in arresting and imprisoning journalists and human rights activists, including Amnesty International campaigners. We call on Turkey to release them from pre-trial detention, ensure fair and speedy trials, and to find a new way forward. But we also believe that we must engage with Turkey, and that it would be a great mistake to demonise or to push that extraordinary country away from us. That is not the right way forward, either. And we believe that this European engagement – military, diplomatic, working together to defeat all those who would do us harm – is in our interests, in our partners’ interests – in our mutual interest. And that mutual interest is nowhere more blatant than in the negotiations on trade that are about to begin. I wore this morning a sweater derived from Spanish sheep, reared in New Zealand, whose wool was shorn and shipped to Italy where it was turned into cloth that was shipped to China – imagine that vast triangle – where it was stitched together and then back to New Zealand before being exported to Britain, France, all over the world. Think of that woolly jumper as it bounds over borders and barriers and customs posts with not a bleat of effort or exertion. That is how trade works today, with standards and supply chains that are increasingly global; and with the help of the excellent negotiators on both sides I have no doubt that we will get a great deal that preserves and even enhances the frictionless movement of goods that is in the interests of both sides of the Channel; and I am sure that we will get a solution that does nothing to undermine the interests of London’s financial sector, because the real rivals of the City are not in Paris or Frankfurt; they are in Hong Kong and New York and Singapore – and in the end I think everyone understands that London is an asset for the entire continent. And when we do that deal I believe we will create a solution that has been so long in the making – a strong EU, buttressed and supported by a strong UK, with each side trading freely with the other, and with the UK able to think about new opportunities in the rest of the world. There is nowhere more exciting to do that than here in the Indo-Pacific; here where there is a third of the global economy, around two thirds of the global population – here where the growth is. And that is why we have decided once again that the UK must be more present, more active, more engaged in this region. And in each of the three countries I have visited in the last week – Japan, New Zealand, here in Australia – I have heard people ask for Britain to get more involved. And we will be here as a partner and friend; aiming at good relations with all the major countries of this region – not choosing between them. Our relationship with China, the engine of global growth, will be crucial now and in the future. As will our deep and long-standing partnerships with Japan and India. And of course, those with you in Australia and our friends in New Zealand. But we need to do more. So I can say tonight that after leaving the EU, we will be seeking to strengthen our own national relationship with ASEAN as an institution. We want these partnerships because they are a big part of how we uphold the liberal international order, in Asia as elsewhere. That is why last week I stood shoulder to shoulder with my colleague Fumio Kishida, the Japanese foreign minister, in denouncing the nuclear adventurism of Kim Jong-un – a man who reportedly deals with his enemies by strapping them to the side of a mountain and shelling them with an anti-aircraft gun. That is why we stand up for the rights of the people of Hong Kong and for the “One country, two systems” principle to be upheld - and I thank Julie Bishop for making that same point when she spoke a couple of nights ago. In the South China Sea, we urge all parties to respect freedom of navigation and international law, including the ruling of the Permanent Court of Arbitration in The Hague. We are also ready once again to articulate our commitment to international order with money and a military presence. That is why we last year sent our Typhoons for the first time to train with Japan, South Korea, and Malaysia, as one of the few countries able to deploy air power 7,000 miles from our shores. That is why one of the first missions of our two vast new aircraft carriers will be to sail through the Straits of Malacca, the route that currently accommodates a quarter of global trade. And if you look at these vessels you will see that they are not only longer than the Palace of Westminster but more persuasive than most of the arguments you will hear in the House of Commons. Not because we have enemies in this region – on the contrary, as I have made clear, we are keen to intensify our friendships – but because we believe in upholding the rule of law. And that brings me to the final key point I want to make tonight. Winston Churchill identified what he saw as the special genius of the English-speaking peoples. For my part I think we must be careful to avoid any such conceit or complacency that English-speakers are especially blessed; but it is certainly true that there is a series of interconnected ideas that have been highly successful, and that I certainly believe in. They are democracy, the rule of law, habeas corpus, an independent judiciary, the absolute freedom to make fun of politicians, and above all the freedom to live your life as you please provided you do not harm the interests of others. It is because they know that they can fulfil themselves in that way that people of talent are drawn to such beautiful cities as London and Sydney – and it is that very freedom that makes these cities so prosperous and so innovative. And it is to defend and expand that ideal – of freedom under the law – that Britain and Australia work hand in hand; because we know that ideal is not really the property or copyright of the English-speaking peoples – but something that belongs or can belong to all humanity. Today, with Julie Bishop and our defence colleagues, we discussed every issue under the sun. I must tell you that in the course of those talks we have over the last 24 hours had an almost embarrassing failure to disagree. We are building greater global security together, and now we look forward to intensifying the trading and commercial relationships that greater security makes possible. We both have great Commonwealth events next year – a great London Summit and I am sure a fantastic Gold Coast Commonwealth Games – and we both believe in the Commonwealth’s capacity to strengthen common values among its members from here, across Asia, into the Pacific. After we leave the EU I am confident that Australia will be at, or near, the front of the queue for a new Free Trade Agreement with Britain; an agreement that could boost even further what we do together. After all we already do so much. I have just met British engineers rebuilding Sydney Opera house. And I know only too well the debt of my own city, London, to Frank Lowy – now Sir Frank – a man who kept investing even in the darkest days of the 2008 crash, and who kept building even when pretty well every other crane had been removed. We trade so much together – you sell us skateboards; we sell you boomerangs. We sell you marmite, you sell us vegemite – and I would not like to speculate on who does better on the deal. You send us Patricia Hewitt and Lynton Crosby, we send you Julia Gillard and Tony Abbott. Never in history has there been such a happy, swollen, distance-obliterating pipeline of people and ideas and goods and services and as that flow increases in pace and volume let us remember that our success is made possible and guaranteed by the ideals we share. They are not unchallenged. They have their enemies and their detractors. But they have stood us in good stead and we can be absolutely confident that they will succeed triumphantly in the years ahead.